The Yorkshire Three Peaks Walk is a very demanding but rewarding walk, which takes in the summits of Pen-y-ghent (694 metres - 2,276 feet), Whernside (736 metres - 2,415 feet) and Ingleborough (723 metres 2,372 feet) all in one circular route. There is no set starting point, but the vast majority of walkers start at Horton in Ribblesdale and climb Pen-y-ghent before ariving at Ribblehead after taking in parts of the Pennine Way and the Ribble Way. From Ribblehead, the walk continues up Grain Ings and over Whernside on its way to Bruntscar and along Philpin Lane to the Old Hill Inn. The last part of the walk leaves the Old Hill Inn and climbs up Ingleborough on its way back in Horton in Ribblesdale via Southerscales Scar and Simon Fell Breast. The route as described is the preferred route the Yorkshire Dales National Park Authority would prefer you to walk, so that the majority of the walk is on well maintained paths and helps prevent further erosion. Parking: The walk starts from the pay and display car park in Horton in Ribblesdale (grid reference SD 807 726) about forty metres from the Pen-y-ghent Café. 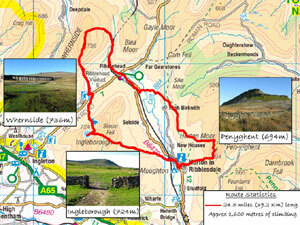 In 1987 the path network in the Three Peaks area was one of the most severely eroded in the UK, with some paths across the more fragile parts of the route having grown to 50m wide in places. This means that, despite the support of a team of Dales Volunteers, the National Park Authority is slowly but surely falling behind with maintenance. The knock-on effect is that some sections of path need major work doing to them far more frequently - perhaps as often as every five years - when a 10-year lifespan should have been expected. As well as the extra work, every additional project adds to the maintenance burden. Read more here on The Three Peaks Project. If you are doing the walk for charity, please consider giving some of your donations to The Three Peaks Project - every £1, £5, £10 etc. that you can give greatly helps with the upkeep of the paths.